Performance always depends on a limited number of variables. The first step is to identify these variables and to map their interrelations. 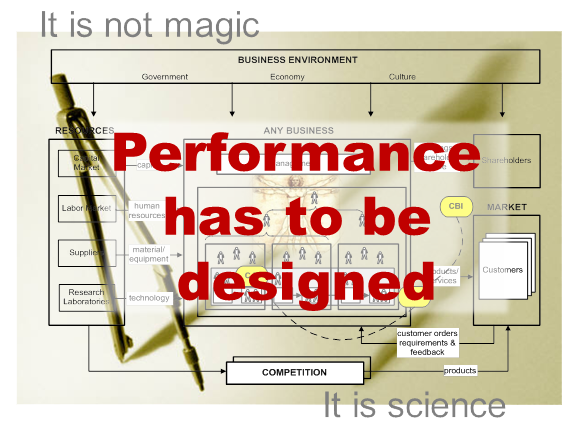 The result is a PerformanceSystem.map that displays what influences a given performance and how those influences are interconnected. Because you can see it as opposed to only talk about it, the map is a powerful tool to develop shared understanding and to get buy-in of people. The shared understanding that has been developed in step one provides the basis for a comprehensive analysis of performance opportunities and gaps. prioritized list of improvement opportunities. opportunities are identified and agreed on. Key Performance Indicators to track improvements are defined. appropriate management system ensuring sustainable and continuous improvement. With us you don’t start one time improvement projects. When we leave you have all the necessary tools at hand to continue your improvement journey and to ensure robust performance delivery.